Superintendent of Schools Colleen Palmer answers questions on her budget at the Board of Education's work session on Friday, January 6, 2017. WESTPORT — Although one teacher is slated to be cut in the proposed 2017-18 school budget, the biggest staffing changes deal with substitute teachers. At an increase of 2.44 percent, or $2.7 million over the current budget, Superintendent of Schools Colleen Palmer’s proposal makes modest staffing cuts. 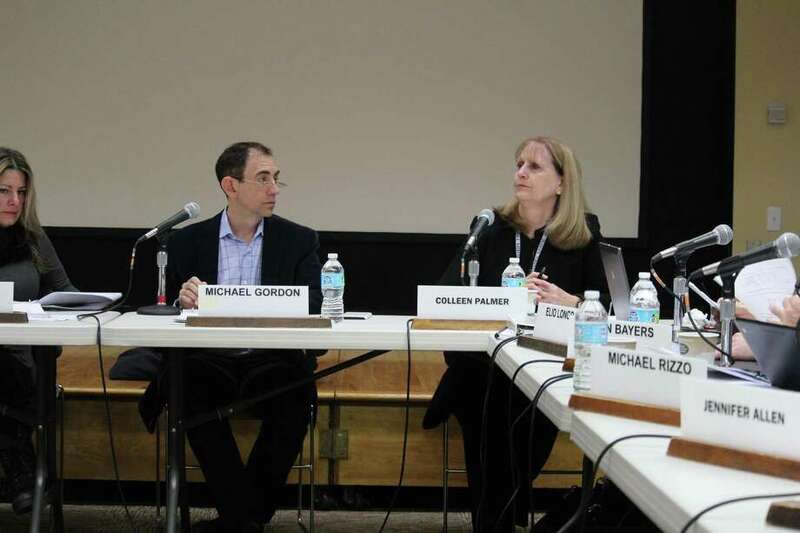 Palmer presented details on the $115 million budget — her first since taking over as the district’s chief administrator — during a daylong Board of Education work session Jan. 6. One Long Lots Elementary School teacher position is set to be cut from the staff, resulting in a savings of $66,000; however, Palmer said by following attrition trends from previous years, she expects that teacher to have a job somewhere else in the district. Across the district, the superintendent hopes to hire more permanent substitute teachers. Due to a lack of substitutes at Staples High School and Bedford Middle School, many full-time teachers have had to cover other classes at rate, around $40 more per day than a long-term substitute. Furthermore, substitutes do not receive benefits. As a result, three long-term substitutes, at a cost of $56,400 were added to those schools. Similarly, at the elementary level, the plan is to replace five teaching interns — a cost of $75,000 — with permanent substitute teachers, a cost of $94,000. Despite the increase, the change would yield savings and provide more consistent coverage when full-time teachers are out for the day, Palmer said. Bringing on permanent substitutes will serve the district more efficiently than the interns because they are only able to work just over two-thirds of a school year, while the permanent substitutes are available for the full school year, she said. While still committed to accepting student teaching interns into the school district, Palmer said the talent pool of the permanent substitutes is of a high quality. “The individuals that we hire for permanent subs, these long-term subs that come in daily, we are so fortunate. Many of them are certified teachers, already, who are looking for employment, and many of these individuals are actually interviewing for a year for us,” Palmer said. Board member Karen Kleine asked if the school board could get a version of the budget that does not include any of the Educational Cost Sharing funds state grant. In the past year, Westport has lost $1.5 million out of a total $2 million in ECS money and could see more cuts, given the steep deficit faced by Hartford. “If these pages are going to look any different, I would like to see that,” Kleine said. ECS funding is given directly to the town, and not the Board of Education, Longo said, and if there is a shortfall, it falls on the town. Because of that, there will be town deliberations on the funding soon. As a way to save money, Sue Calger, a PTA council co-president, recommended eliminating bus monitors, which cost $220,000. Last year’s budget proposed eliminating all bus monitors except those working with special education students, but was eventually shot down by the school board, following an outcry from parents. The measure would have saved $125,000. School board Chairman Michael Gordon called for a re-examination of how the bus monitors are used throughout the school district.